A short time ago I got a letter from Jimmy Curran, a Galashiels man, who has for almost a quarter of a century been one of the most distinguished athletic coaches in American School and College athletics. He was in South Africa with the HLI during the Boer War, and when out there, he found the young Halswell. 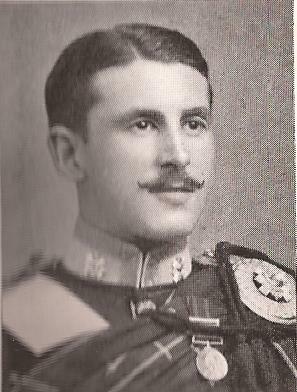 When the battalion came home and was brought to Edinburgh Castle, Curran induced the then Lieutenant Halswell to get into training and, running in the 440 yards championship in the Championships of 1905, Halswell revealed a bright and shining star had arisen in the Scottish athletic firmament in the person of this gallant son of an English father and Scottish mother. I went to Edinburgh Castle to interview the young officer. He refused to talk. It was not the thing to do on the part of an officer. But, with a quiet chuckle, he handed me a scrapbook, sent him by a relative of his mother, in which he said he would find everything there was to know of him athletically. “I must return it,” he said, bidding me good-bye. This little action was worthy of a man who, when appealed to be a Press representative as to how he spelt his name – Mr DS Duncan refused to acknowledge a final “e”, and I took my cue from the SAAA Secretary – wrote that he spelt his name this way. But the recipient of his letter to this day cannot determine whether it is a final “e” or a flourish of the pen. Halswell “made history” in Scottish athletics in 1906. He won four running titles in one afternoon. It was freely prophesied that the like would never be seen again. It has never been attempted, and may stand as a record for all time. The last time I spoke to Halswell was to commiserate with him on the unseemly proceedings in connection with the Olympic Games 400 metres race. The entire circumstances distressed the high-minded military athlete. He hated the idea that a conspiracy had been engaged in, and he hated still more the fact that the re-run was not taken part in by the American athletes, acting under orders. The fact was Halswell cared far more for athletic expression than for results. It was felt in the battalion that his reputation was being, as it were, traded in by sports promoters. He said he would end his career with the quarter mile in the Scoto-Irish International, and did so. Some one gave me a copy of a photograph of Halswell starting in this race. I had it copied and mounted, and many years after EH Liddell took away the second copy as one of many souvenirs of his stay in this country. And that’s where the extract ends. The four titles in one afternoon referred to above were at the SAAA championships held at Powderhall on 23rd June 1906 and the events were – 100 yards in 10.4 seconds, 220 yards in 23.2 seconds, 440 yards in 51.4 and 880 yards in 2:00.4. The Scoto-Irish International where he ran his last race was on 11th July, 1908, at the Exhibition Grounds, Saughton, and he won the 440 yards in 51.8 seconds. “Taken as a whole, the twenty-fourth annual championship meeting was a great triumph for the Association and amateur athletics generally. The number of spectators, ana consequently the excellent financial result, made it clear that when genuinely sound athletics contests are provided, and the voice of the “bookie” is stilled, enthusiastic and intelligent public support will not be lacking. Better weather could not have been desired by either competitor or spectator. No wind, no rain, no broiling sun and yet a trace of freshness in the air made the day ideal. I’ll leave it there – it is not a proper profile, just some information about a wonderful athlete who also seems to have been a really good man as well. Many know a bit about the Olympic fiasco which is not recounted here but perhaps this rounds out the perception of Lieutenant Wyndham Halswell.